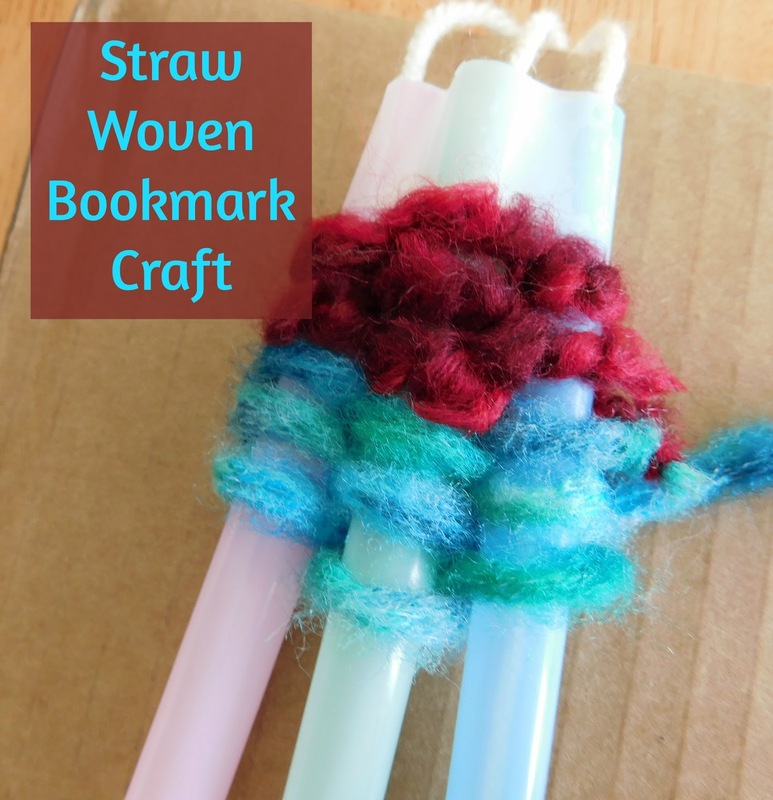 Looking for something new to try with the boys I looked up a few yarn and cloth crafting projects and thought it might be fun to try straw weaving. It was something I remembered doing myself in school and thought it was pretty easy. When first tackling our project I had the boys decide if they wanted to make a bookmark, cuff bracelet or scarf. This helps determine the length of the yarn we need to thread through each straw. I then used 3-4 straws per project depending on how wide each person wanted their finished project to be. Once I had each persons length of yarn threaded through the proper amount of straws I knotted the top of their yarn pieces together and taped it down to a piece of cardboard. The thin while yarn is threaded through all four straws, tied in a knot and taped to the back of the cardboard. Since the straws were still moving around a lot and it felt difficult to work with we quickly used a band of scotch tape around the top of the straws to hold them together. We then tied the color of yarn we wanted to work with right to the first straw and began weaving in and out. Once Evan reached the end of his straws he decided his bookmark was long enough so we cut the tape holding the straws together, slid all the yarn up toward the taped down knot and pulled the straws right out. We then knotted up the end that was left making sure to keep his "stitches" nice and tight and including the yarn he had been waving so nothing would unravel. He elected to keep one end of the white guide yarn longer and showing like a tail. Alec, however, wanted a much longer bookmark and asked what to do when he reached the end of the straws; again we clipped the scotch tape off and pushed the woven yarn up towards the knot we had taped down while guiding the straws just a bit lower so he still had something to weave around. He had to push the yarn up and pull the straws down a few times. Then he too decided he was done and we pulled the straws all the way out, made sure the stitching was tight and tied everything off with a knot. I worked on my scarf for most of the afternoon and was a bit bummed that it ended up being so short; I ran out of yarn to weave with! However, I do love how soft it is. Have you ever tried straw weaving? Great project! I've seen this done, but I haven't tried it myself. I vaguely remember doing this myself as a child but hadn't really remembered how to get it started or anything. It was fun. I'm going to have my daughter try this project - she's always looking for some handicraft to make gifts for those she cares about. Thanks for the pin; I hope she enjoys it. My boys like making gifts too. I've never done straw weaving before! Looks fun. Thanks for sharing at Party in Your PJs! I've never heard of straw weaving, but I love the completed projects! Thank you for sharing your weaving with us on Party in Your PJs.